Snow and ice during the wintertime has led to other means of transportation, such as sledges, skis and skates. This also led to different pastimes and sports being developed in the winter season as compared to other times of the year. Naturally, winter sports are more popular in countries with longer winter seasons. While most winter sports are played outside, ice hockey, speed skating and to some extent bandy have moved indoors starting in the mid-20th century. Indoor ice rinks with artificial ice allow ice skating and hockey to be played in hot climates. 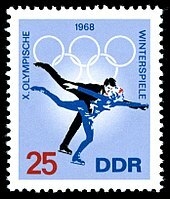 Note: the Olympic rings next to a sport indicates that this particular sport is included in the Winter Olympic Games, as of the 2014 Winter Olympics in Sochi. The Paralympic logo indicates the same for a sport not in the Olympics but in the Winter Paralympic Games. ^ "winter sports, noun". Chambers 21st Century Dictionary. Retrieved 22 February 2010. 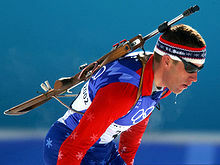 ^ "Cross country for the Winter Olympics". Retrieved 26 July 2016. ^ "Snow Bowling". Strictly Snow Games. Retrieved 21 January 2017. ^ "Snow Golf". Strictly Snow Games. Retrieved 21 January 2017. "Winter Sports: Sport guides". BBC Online. 20 February 2010. Retrieved 22 February 2010. Look up winter sports in Wiktionary, the free dictionary.